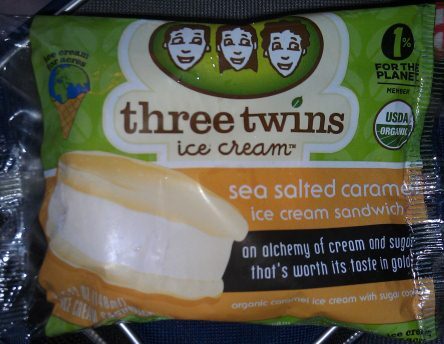 [New for 2013] Things certainly are looking up for three twins ice cream as they continue to grow one of the nation's few widely available organic ice cream companies. They've got two new ice cream sandwiches and 5 new pint-sized flavors available (6 if you count today's Sergio Romo's Mexican Chocolate announcement). You can buy the sandwiches in boxes of four (approx $6.99) or as singles for around $1.99. 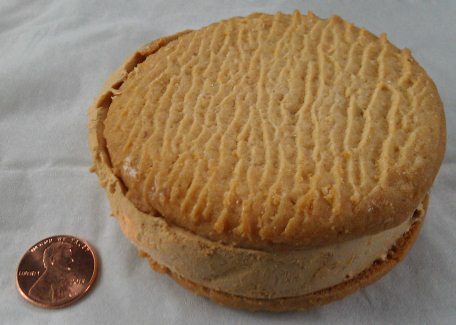 Ok, time for "an alchemy of cream and sugar that's worth its taste in gold" which translates to "organic caramel ice cream with sugar cookies". Now don't forget that three twins started as a scoop shop, so they've been making these sandwiches fresh for years. It's only now that they are growing that they can offer them nationally. To be honest, I was hoping for a little more for my two bucks considering I can grab a 600lb gorilla for a buck fifty. It feels small, it looks small, but at least it's organic! So what's the word on the street? Too much cookie, which is a shame really. I was stoked to finally see an ice cream sandwich made with a actual sugar cookie, but this sandwich just isn't balanced. The soft but somewhat dry cookie totally overwhelms the ice cream inside. I thought the caramel Ciao Bella sandwiches had trouble but the filling here is even more buried. I can't even comment on it because I could barely taste it. The cookie itself is pretty neat but I need to taste the ice cream in my ice cream sandwich, especially one with 70% of my saturated fat for the day. I think I need to add the disclaimer that this isn't a bad sandwich, it's just that I hyped it up too much in my mind. When I made my own three twins sea salt caramel sandwiches, I went with a giant slab of ice cream and it was awesome. I wanted that same experience here and it just didn't happen.